I've been doing so much work in DOSBox for other people and myself over the last few weeks again I thought I'd do some more posts about it. I know you're all intensely fascinated by my DOS nostalgia! Unfortunately I've finally come across an application that DOSBox doesn't tango with: XTreeGold. We used to use the XTreeGold file manager in tandem with Brown Bag Software's PowerMenu before we got Windows 3.0 then 3.1 on our home computer in the late 1980s and early 1990s. Alas when I tried using it in DOSBox it returned a blank directory pane and only pointers to files without any reported sizes. I'm assuming it's because the DOSBox "filesystem" is merely just a mount of a directory on the host and XTG uses some low level system calls that aren't implemented. IBM's PC DOS Shell works just fine. While I enjoy using Midnight Commander which is a clone of Norton Commander from DOS days, I still think XTreeGold is the best file manager ever made. 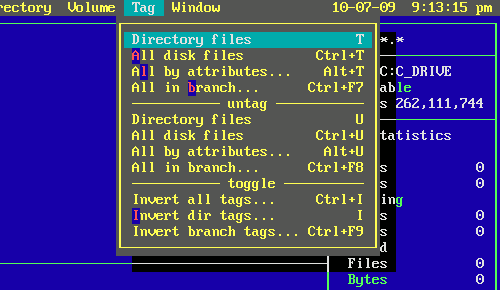 It separated files and directories into different panes similar to Windows 3.x, and instead of arbitrarily selecting files it let you "tag" files in any number of random directories and perform actions on them. Even as of 2009 no GUI based file manager [that I'm aware of] lets you do this besides clumsily selecting individual files in single open directories.